Patterns > Towels > Ta-dah Towel Bundle With Buttons- All 12 Designs! These "Super Simple" towel designs are great for beginners! This bundle includes 4 patterns featuring 12 designs for each month of the year! Buttons included (2 button packs). Towels are not included. Skill Level: Super Simple. Finish in One Day project. 3 Winter towel designs: Holiday Lights- a Christmas Holiday design featuring a snowy tree and Christmas lights, Snow Birds- a winter design that features a snowman in a scarf and his friends the cardinal birds, and Winter Hearts- a fun Valentine's towel design featuring appliqued hearts. Towels are not included. Skill Level: Super Simple. Finish in One Day project. 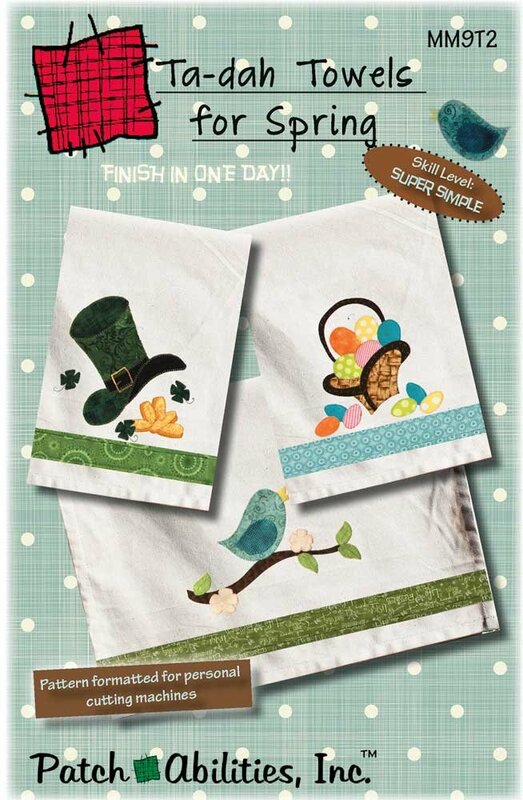 3 Spring designs: This pattern includes instructions for 3 Spring towel designs: Luck & Gold- a fun St. Patrick's Day (St. Patty's Day) design that features a Leprechaun hat, shamrocks, and gold coins, Bunny Basket- a basket filled with Easter Eggs and Little Birdie- a fun spring design that features a singing bird on a tree branch. 3 Summer towel designs: The designs are as follows: Strawberry Sweet features an appliqued strawberry design- a perfect summer design. Spark of Fun features a lit applique firecracker- this fun chunky firecracker is perfect for 4th of July! Summer Yummies is a ice cream applique design. The ice cream cart with umbrella applique design says, "Summer is here!" 3 Autumn designs: The fall designs are as follows: Pumpkin Time- a great pumpkin and green vine design, Sweet Treats- a Halloween inspired design that features a treat bag and candy, and Turkey Turkey- a Thanksgiving themed towel pattern design featuring a fat turkey!